We have been able to offer excellent Gas Outlet Point to the customers. These products are designed and manufactured in compliance with the international quality standards. In addition to this, highly skilled professionals are employed for manufacturing these Gas Outlet Points. In our range, we offer Hook Loose Type, Gas Outlet Point B.S Type (Front Loaded), Terminal Unit (Sapphire) With Probes And Adapters and Diamond Type Gas Outlet Points in the market. We have gained expertise in offering a genuine quality range of Gas Outlet Point to the esteemed customers. These DEW-type Gas Outlet Points have recessed & color-coded outlets. Moreover, these products are considered the most technically & advanced means of providing medical gas connections to central piping systems, without any type of hassle. 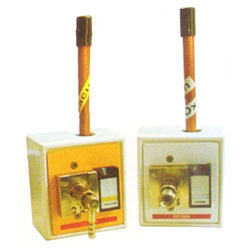 We are one of the most trusted names of the industry known for offering high quality Gas Outlet Point to our clients. These front loaded products offered by us can easily be repaired without removing the front facia. Moreover, we provide these products to the clients with non-interchangeable self-sealing. 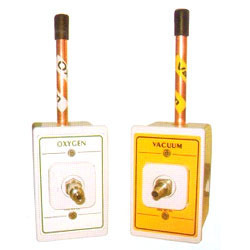 Our product range also has quick connect gas outlet for oxygen, N20, vacuum, air-4 or air-7. 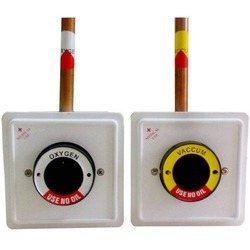 The Medical gas outlet combines case of installation and low cost maintenance. Non-interchangeable self-sealing quick connect gas outlet forOxg en/N 20/Va cc u m/C.A.4/C.A.7/C02. Available for head wall unit/wall/pendent units. Front fascia of gas outlet are interchangeable and gas colour coded. Secondary isolating valve allows maintenance of the gas outlet without need for a pipeline system shutdown. We are one of the most renowned names of the industry engaged in offering a high quality range of Gas Outlet Point in the market. Our product range is manufactured in compliance with the international quality standards. These Gas Outlet Points are widely appreciated by the clients for their sturdy construction, compact structure and durable standards. 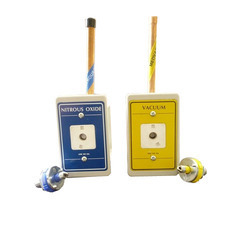 We are engaged in offering genuine quality Terminal Unit to the customers. 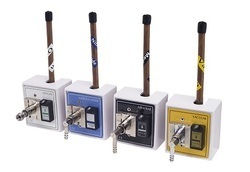 Our range of Terminal Units (sapphire) is made available to the clients with probes and adapters of O2, N2O vacuum gas outlet points (sapphire type) that accept, retain as well as release by quick release mechanism. The mechanism is designed single handed operations.